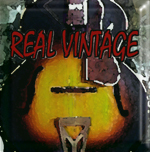 feel free to use one of these banners for your links to Real Vintage! King Biscuit Time - our blues band, from Sicily Daniele Camarda - bass player, a good one! Nicola Costa - one of Italy's TOP guitar players. Umberto Porcaro & Roller Coaster - mo' blues...! the Max Panconi Orchestra - red-hot big band! Eleonora Farri - singer, painter, artist from Italy. Fetish Guitars - all-Italian Vintage Guitars website Vintage Hofner - The main source on vintage Hs.